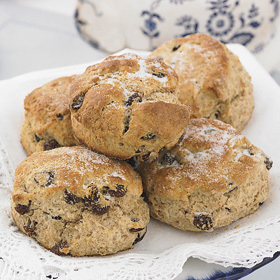 What can beat a fragrant, warm, fresh scone, thickly spread with butter and tangy jam? A scone to be eaten, of course, in a cosy, welcoming cafe with a good cuppa on the side. A home-made scone strikes me as very Hastings – slightly old-fashioned, very English, individual, unpredictable, crumbly and irregular, a bit crusty, definitely a bit fruity. What better excuse to visit the local cafes and tea-shops? This wasn’t getting the scones buttered. The sea-front road is usually jam-packed with folk come to see the sights, visit the pubs and eat Hastings fish and chips. It is not good scone territory here – too fishy. The handsome, bronze-tiled Jerwood Gallery has a glass-balconied gastro-cafe with a great sea view. Possibly it sells hand-created, directional scones along with foodie things like gravadlax and gourmet fishcakes served on little wooden planks. You can call me mean, but I wasn’t paying another entrance fee just to check on their provision of bakery goods. The paintings are well worth a visit, though. Beside the Jerwood is our first real cafe - Eat @theStade, with big sliding windows opening onto a sunny outdoor seating area. They do good tea and coffee, nice cakes and home-made biscuits, but when I looked in – no scones on sale. I headed inland, along the picturesque Old Town High Street, where one of my favourite cafes, The Land of Green Ginger, is tucked away between the half-timbered buildings. It has a little sheltered garden out the back, where green tables are surrounded by plants (and gurgling drainpipes). I like to look up at the Old Town ‘behind the scenes’ jumble of crooked roofs, old chimneys, tiny windows, balconies and staircases. Inside, the cafe is popular with Hastings mums, who cram their huge 4 x 4 baby buggies between the tables, making the place a bit hard to negotiate. The lunchtime food is excellent. I particularly recommend the twice-baked cheese souffle – but, tragically, on my survey visit – scones were sold out. I was now getting anxious, and hurried round the corner to George Street. In good weather this quaint street is full of people sitting outside the waist-line busting selection of cafes, pubs and restaurants. A board outside the Green Cafe: ‘We specialise in scones,’ caught my eye, as did another beside it, advertising a genuine Italian Gaggia coffee machine. I expected a huge shiny hissing monster with ‘Gaggia’ in huge chrome letters across the front, but the discreet modern version just sighed elegantly, while producing excellent coffee. The cafe owner proudly listed four kinds of scone: plain, cheese, sultana, and the variety I chose - cranberry with blueberry. It was fabulous – warm from the oven, crusty on the top yet soft inside, with a good fruity tang. While the decor in the cafe is a bit strange – it must have been a butcher’s shop or something, because it is all covered in white tiles - it is friendly, warm and welcoming. High marks here. I was now too full to visit ‘Cafe Unwind’ across the road, which sells tea with two home-made scones, cream and jam, all for £3.30 per person. This looked delicious and is excellent value, but I reluctantly had to leave it for another time. No scone hunting expedition would be complete without a trip up in the lift to the West Hill Cafe. I never tire of the lifts – the little Victorian cars, the scary view down to the bottom as you rattle slowly up, passing the other car on its way down. Just be careful to avoid queuing behind a huge party of French school-children. The terrace of the West Hill Cafe has easily the best views in Hastings, and probably, the best for miles around. Looking across the lichen-covered roofs of the Old Town you can see the open greenery of the East Hill and the Country Park. Far below, the boats sit in a row along the fishing beach, and you can watch the ant-size people in the amusement park, on the miniature railway, the go-karts, and bouncing on the trampolines. Mostly, of course, you can survey a vast expanse of sea, with distant ships processing slowly past. Despite its unrivalled location, the cafe itself is wonderfully ramshackle – I am astonished it has not been taken over by Jamie Oliver to be turned into a foodie destination. The plastic tables on the terrace are cracked and rickety, and hopeful seagulls wait on the battered iron railing, clattering their beaks expectantly. Milk and tea come in those classic English cafe metal jugs and pots that pour their contents all over you and the table. The tea and coffee is good – if you can get any into the cup. On the day I visited with my husband, scones were on sale, but unfortunately they looked stale, so we shared a very tasty date slice instead. In Hastings new town, we chose the popular Cafe des Arts in Robertson Street as our scone sampling destination. It is a social enterprise, staffed by people on the Autistic Spectrum, and sells a variety of interesting pottery and art-work as well as food and drink. When we arrived, the scones were not quite out of the oven, so we settled down to wait, in big leather armchairs. The coffee was nicely served on fancy white china with a little biscuit on the side.. In a few minutes, a fabulous smell drifted across the room, and a cook emerged from the kitchen with scones on a wire tray. We watched eagerly as two were carefully arranged on a plate with butter and s little pot of jam. The lady in charge gestured towards us... our mouths watered. The grave-faced waiter, concentrating hard, picked up the plate and marched straight past us, with never a glance in our direction. He deposited the plate on a table at the farthest end of the cafe and disappeared from view. When our squawks of distress brought two more scones, the wait was worth it – they were fantastic. Very high marks here, even with the eccentric service. A brisk walk along the sea-front brings us to St. Leonard’s, and Smith’s Cafe, along Grand Parade just past Warrior Square. They have a couple of tables outside, but you have to look across the busy main road to see the sea. A big blackboard on the wall advertises a selection of meals. The cafe has an excellent atmosphere, and I enjoy the eclectic mix of reading matter, including, for example, high-end design magazines, in Italian, dating from the 1990s. Coffee is excellent. When we tried the scones they were fresh, but a little crumbly. It was hard to spread butter and jam without them falling apart. High marks for the cafe, and good food generally, but only average scones. So, room for one last scone destination – a surprise here – the cafe at the Hastings Garden Centre on the Bexhill Road. Yes, I know it’s a bit out of the area, but it is very handy for a visit to the tip….The cafe itself is not inspiring, and fills up with the most senior of Hastings’ senior citizens, enjoying their cut-price pensioners’ meals. However, the scones, made fresh every morning, are so exceptionally and outstandingly good that they gave me the original idea for the Scone Guide. In warm weather, you can sit outside among the plants, and enjoy the company of the friendly tortoiseshell Garden Centre cat. I know I have left out many excellent places, and that new cafes keep appearing all the time. This piece can only give a flavour of Hastings through a sample of its cafes – and the scones they sell. What is the final verdict for best scones? In first place, it must be Hastings Garden Centre. Joint second, Café des Arts and the Green Café in George Street.